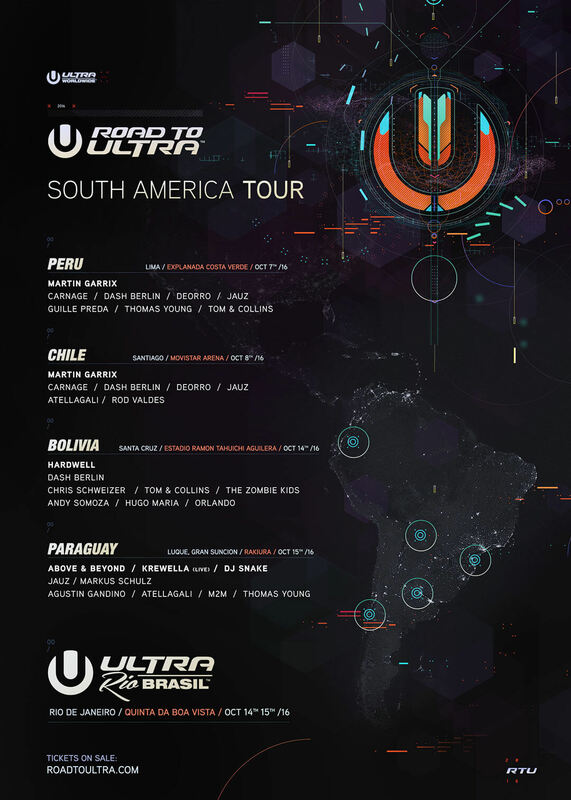 In what has already been a historic year for the world’s most international festival brand, ULTRA Worldwide releases the long awaited lineups for the upcoming Road To ULTRA South America tour in Peru, Chile, Bolivia and Paraguay. The almost two week long extravaganza will kick off in the beautiful country of Peru. After making its official debut last year to over 18,000 attendees, this year’s event will take place on October 7 at the Explanada Costa Verde in Lima. The ancient historic city will play host to some of the biggest entertainers in electronic music including Martin Garrix as headliner, Carnage, Dash Berlin, Deorro, and Jauz as support, along with Guille Preda, Thomas Young and Tom & Collins as local spotlight artists. With Early Bird tickets selling out instantly upon release, Tier 1 tickets are now on sale for S/ 242 ($72 USD). Moving the party down south, the next stop on this continental journey will be in Santiago, Chile on October 8. With views of the Andes as a backdrop, Ultranauts will be given a chance to catch the same amazing headliners and support that played in Lima the day prior including Atellagali and Rod Valdes as local talent, at the centrally located Movistar Arena, which will be decked out with the full RTU experience including top of the line stage, light and sound production. Tier 1 tickets for this highly anticipated event are already sold out, and Tier 2 tickets are currently priced at CLP 38,000 ($57 USD). Bolivia will get their dose of ULTRA epicness on October 14, with a completely different lineup taking over the massive Estadio Ramon Tahuichi Aguilera in Santa Cruz. After being voted ‘Best Electronic Music Festival in Bolivia’ by thousands of fans in the RQP National Radio Awards, the Dutch sensation, Hardwell is set to headline this year’s edition complete with support from Dash Berlin. Chris Schweizer, Tom & Collins, The Zombie Kids, and local acts Andy Somoza, Hugo Maria, and Orlando will also perform as Road to ULTRA Bolivia is set to yet again become one of the largest electronic music events the country has ever seen. Tickets for the event are currently on sale and priced at Bs. 400 ($58 USD). Last, but certainly not least, Road To ULTRA will be touching down in Paraguay on October 15. Headliners Above & Beyond, Krewella (Live), and DJ Snake are set to light Asunción ablaze, with JAUZ and Markus Schulz as support, and Agustin Gandino, Atellagali, M2M, and Thomas Young providing local flare. Early Bird tickets sold out almost immediately, and fans can now purchase Tier 1 tickets for Gs. 225,000 ($41 USD). Ultranauts will want to act quickly, as the final South American RTU event will undeniably be the best dance music event Paraguayans will see for the remainder of 2016. Following this immense run of Road to ULTRA events, the South American tour concludes with the first ever Rio de Janeiro based edition of ULTRA Brasil taking place on October 14 & 15 at the stunning Quinta da Boa Vista Park.